Phoenix, Arizona—What started out as a purse snatching ended in the death of a pedestrian as the suspects fled police and ran a red light. The events started around 7:30 a.m. on Thursday when three girls approached a 24-year-old woman and demanded her purse and revealed what appeared to be a stun gun. After the woman complied, the three girls crossed the street to a park where they joined two young males. Phoenix Police Department officers arrived at the scene near 45th Street and Palm Lane, where the woman directed them to the nearby park. As police approached the suspects, their vehicle sped off. Police caught up with the suspects about a half mile from the park. 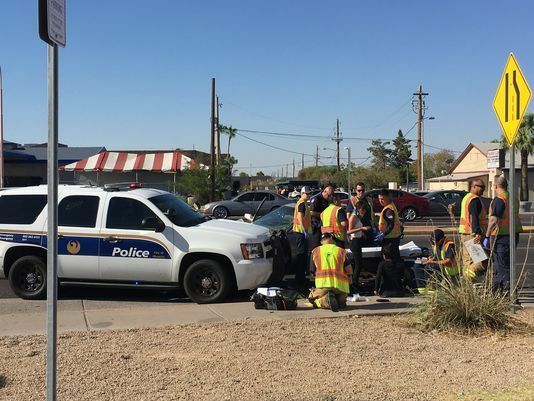 The suspects had run a red light at 44th Street and McDowell and collided with an SUV that was traveling northbound on 44th Street. The SUV then struck an unidentified 44-year-old woman who was standing on the median. The woman was transported to a hospital where she later died of her injuries. The driver of the SUV was taken to a hospital for treatment of her injuries. The suspects’ vehicle went on to collide with a city bus. The driver was the only occupant of the bus and he was not injured. One male and one female fled the scene while the other three suspects remained in the car with minor injuries. One suspect was 14 years old and another was 12 years old. We extend our condolences to the family and friends of the woman who died as a result of the unlawful and reckless conduct of others.